﻿﻿Hueco Tanks is home to world-class bouldering. ﻿﻿﻿The parade of black mats marches through the desert, bobbing up and down through craggy rock outcrops and swerving to avoid cactus and other prickly plants. The unusual parade takes place several times a day at Hueco Tanks State Park and Historic Site as rock climbers, carrying “crash pads” on their backs, hike from crag to crag to test their skills on some of the world’s best rock. 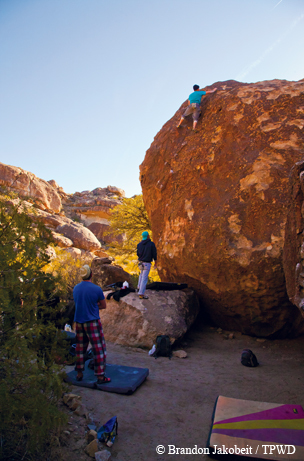 Every winter, climbers gather at Hueco, east of El Paso, to go bouldering, a type of rock climbing in which climbers scale boulders or short walls without a rope. 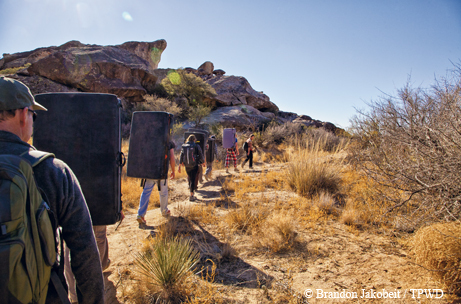 Climbers carrying crash pads head out for a day of bouldering at Hueco Tanks. Our version of the parade stops at a climb called Meddle Detector, a severely overhanging wall that requires steel-grip strength and some serious climbing moves — torso twisting, dynamic lunging, knee-locking and heel-hooking — in order to scale it. Our group spreads out the crash pads, and a climber from Minnesota gives the climb a try. After a series of strenuous moves and some world-class grunting, he pops off and goes hurtling toward the ground, landing on his back, his fall cushioned by the pads. We nervously wait to see if he’s OK.
Thankfully, he pops up unhurt. And instead of cursing his failed attempt, he exclaims, “This climb is awesome!” and gives it another go. Hueco Tanks, with its sunny, mild winters, is one of the primary spots on the U.S. winter climbing circuit. Every year climbers come from around the world to this desert outpost to get strong, hone their technique and, well, climb a lot of boulders. “It’s one of the top bouldering areas in the world,” says Jeff Jackson, editor of Rock & Ice magazine and a longtime climber who grew up in Texas, adding that he thinks only France’s Fontainebleau and a spot in Australia might rival it. Melissa Strong works out the moves on the Aftershave boulder. I’ve been to Hueco Tanks several times over my climbing career, and to me, it’s a place that feels made for climbing more than any other place I’ve been. Beyond the rock, I’m always fascinated by Hueco’s climbing scene, populated by a colorful mix of visiting Europeans, top U.S. climbers, El Paso locals and grizzled vagabonds affectionately known as “dirtbag” climbers. The crowds hadn’t reached their typical winter level at Hueco when I visited last December, but a recent cold front that dropped snow in the West was likely to bring in more climbers from Canada, Colorado and other points north. The Hueco Rock Ranch, where many climbers camp or rent a room, was starting to fill up. A woman from Switzerland was spending two weeks there. Two groups from Japan were due soon. A climber from Connecticut and his girlfriend had been spending time there on a two-year U.S. rock-climbing trip. A trio from Dallas was there for the week. Some climbers stay for months. Climber Jason Kehl has spent the past several winters at Hueco Tanks. 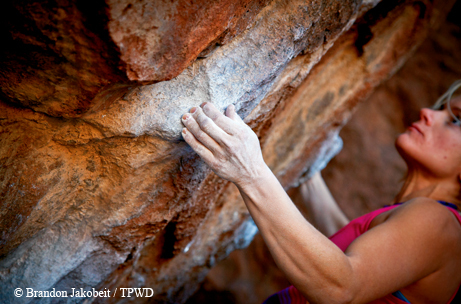 Kehl visited Hueco for the first time in 1995, when the park was riding a wave of popularity. 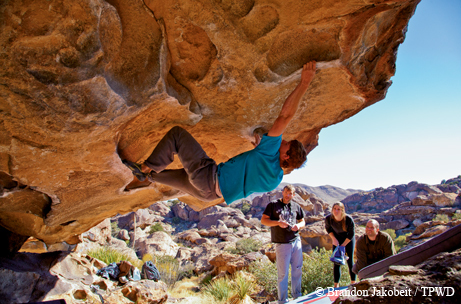 Hueco had the buzz as the place to be for winter climbing in the United States. In 1998, park managers, worried about the effects of increased erosion, devegetation and vandalism, instituted new rules limiting the number of visitors and access to much of the park. Some climbers, angered by the moves, never came back. Kehl did. ﻿Ana Burgos, with climbing chalk on her hands, heads up a Hueco bouldering route called Barefoot on Sacred Ground. In bouldering, climbers ditch the equipment used in traditional climbing — harnesses, ropes, etc. — and use only their hands and feet (with climbing shoes) to scale rocks generally no more than 20 feet tall. Climbers have scaled boulders for decades, but they did it mainly to practice for bigger climbs — as a way to do hard moves without getting too far off the ground. In the 1990s, bouldering came into its own as a separate climbing discipline. Hueco Tanks is recognized as the birthplace of modern bouldering, and the history of the sport is inextricably linked with the park. Hueco Tanks has the distinction of being the first climbing destination where people went mainly to boulder rather than climb tall cliffs. It is where the bouldering rating scale, called the V scale, was developed, named after prolific Hueco boulderer John “Vermin” Sherman. (The scale, which goes from V0 to V15, indicates the difficulty of a climb, called a boulder problem.) And it is the place where the crash pad, a bouldering must-have, was developed. In the early days, we used couch cushions wrapped in duct tape to cushion our falls; now, climbers can buy thick, foldable mats with backpack straps. Bouldering may lack the drama of climbing high peaks, but its adherents are drawn to the purity of the climbing, the powerful, graceful moves required, the ability to test physical limits and the mental challenges of figuring out a workable path to the top. Top climbers like Todd Skinner and Swiss boulderer Fred Nicole pushed the very limits of climbing at Hueco Tanks. Tanner Merkle warms up on a climb in the East Spur Maze. In 2012, Hueco Tanks made news in the climbing world when Ashima Shiraishi, age 11, tied the record for “hardest boulder problem by a woman” by completing Crown of Aragorn (V13). In Hueco’s 1990s heyday, the Spandex-clad Euros, hard-climbing U.S. stonemasters, well-traveled dirtbags and ordinary climbers like me had the run of the park, poking into every crevice, cranny and cave to climb classic boulder problems. In the evening, we’d retire to Pete’s Hueco Tanks Country Store, a ramshackle quonset hut that served as the unofficial climbers’ headquarters. At Pete’s, climbers would camp, play hacky-sack, drink beer around a raging bonfire, engage in ill-advised antics, nurse their aches and pains and swap stories about the hard moves they were pulling at the park. In my stays at Pete’s, now closed, I’d plunk down the couple of dollars a night required to crash with other climbers in the cluttered upstairs sleeping area, furnished with threadbare, mismatched thrift store furniture and a 12-inch black-and-white TV. I’d find a spot on the floor, throw down my sleeping bag and get ready for the days of great climbing ahead. Today’s Hueco isn’t the crazy scene it used to be, and that’s probably a good thing. Visitors these days can go to the North Mountain area of the park on their own but must be accompanied by a professional or volunteer guide in the rest of the park to ensure protection of the fragile desert resources and rock art. The climbers in our group last Decem­ber had signed up for a volunteer-led tour in the guided area of the park. It’s called a tour, but climbers — in our case, from British Columbia, Minnesota, Dallas and El Paso — can generally decide among themselves where they want to go. One of our stops was a climb called Moonshine Roof. The shortness of the climbs at Hueco doesn’t make them easier than long routes. 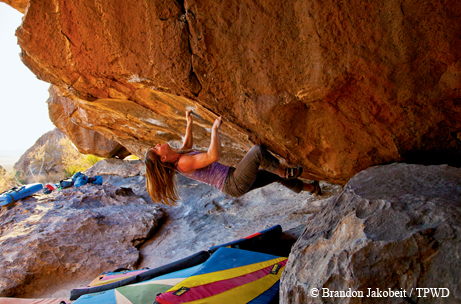 At Hueco, several advanced bouldering routes require climbers to traverse the underneath sides of overhanging rocks like geckos crawling across the living room ceiling. At Moonshine Roof, the climbers in our group — spurred on by shouts of “Come on, you got it!” and “Stick it!” — took turns finding pockets and edges to use as handholds and footholds as they improbably made their way across the ceiling of an overhang. Some of them completed the climb, and others tumbled off when their arms flamed out, caught by other group members acting as spotters. Most of the climbers made it past the section of overhang known as the Surfboard. Others tried repeatedly to make the big move after the Surfboard but kept falling there. Tanner Merkle, a climber from Dallas, decided to try a harder, alternative section of the climb. At the lip of the overhang, the hardest part, he lost his footing, leaving him hanging on only by his fingertips with his feet swinging freely below. Incredibly, he held on, and he threw a foot above his head for a move known as a heel hook, finishing the climb from there, to the astonishment of everyone in the group. Tanner Merkle makes his way across the ceiling of Moonshine Roof. I left the hard climbs for the younger, stronger climbers to tackle while I stuck to easier routes like the Flexin’ Texan in the East Spur Maze and the hueco-to-hueco line Black and Blue. “Hueco,” Spanish for hole or hollow, has become the accepted climbing term worldwide for a certain type of formation — a round, scooped-out pocket in the rock. And oh, those huecos. They are a big reason why the climbing at Hueco is so popular and so much fun. They range from small pockets that’ll fit a finger to huecos big enough for a couple of people to eat lunch in. Some walls have hundreds of huecos, and places like the iconic, hueco-filled Round Room provide a climbing experience that can’t be duplicated elsewhere. The unusual, high-quality rock — an ancient granite known as syenite porphyry — adds to Hueco’s appeal as a climbing wonderland. Climbing isn’t the only reason people visit Hueco Tanks. The rugged collection of boulders and small mountains provides an oasis in the desert. It’s been attracting people for thousands of years, drawn by the water that collects in the hollows. Prehistoric people and Native Americans drew paintings on the rock walls, making Hueco Tanks one of the most important pictograph sites in the Southwest. The rock art presents park officials with a daunting management challenge. Hueco Tanks is one of the state’s most celebrated recreational areas, but it’s also one of the most culturally and historically significant sites in the state. Allowing recreation while protecting the cultural resources is like trying to host a volleyball tournament at the art museum. It can be done, but it’s tricky. Proximity to pictographs or other archaeological resources led to the closure of several boulders and climbing walls, including the world-famous Mushroom Boulder, home to some of the park’s classic climbs. 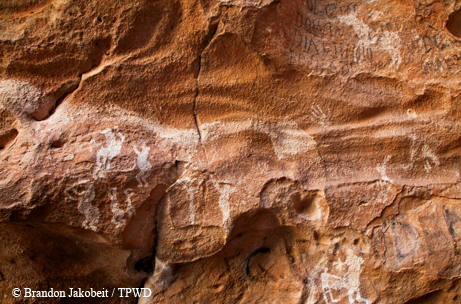 Pictographs can be found throughout Hueco Tanks. On my visit to Hueco Tanks, I unexpectedly ran into some colleagues from the Texas Parks and Wildlife Department archaeology lab. We shook hands but noted that climbers and archaeologists haven’t always seen eye to eye on the direction of the park. One of the archaeologists pointed out that we’re all part of the TPWD mission — to conserve natural and cultural resources and to promote outdoor recreation. Makes sense, but those two parts aren’t always compatible. Which part of the mission are you going to emphasize? There’s no place where that question has been dissected, debated and anguished over more than Hueco. In the 1990s, the park was being loved to death, says Wanda Olszewski, park superintendent. Yearly visitation, which now hovers around 30,000 people a year, was 152,000 a year at its peak. Graffiti on some pictographs and an increasing worry about damage to the desert led the park to put more restrictions in place in 1998. Visitation is now limited to 70 people at a time on North Mountain and 160 in the guided areas. Olszewski says that with all the competing interests, there’s no way to make everyone completely happy. As I climbed from hueco to hueco and topped out on another classic boulder problem on a perfect winter day, it was easy to see why people have found this place special — from the prehistoric people who made it home in times past to the rock climbers who love the place today. Hueco rocks. ﻿If you climb in Texas, you probably climb in state parks. That’s where most of the state’s established climbing areas are. Enchanted Rock State Natural Area. This Hill Country park contains hundreds of climbs on granite formations. It’s a popular climbing destination featuring crack climbing and face climbing with routes that can extend a couple of hundred feet tall. Hueco Tanks State Park and Historic Site. Sure, it’s known for its world-class bouldering, but the park also has outstanding traditional roped climbing on cliffs up to 350 feet tall. Franklin Mountains State Park. This El Paso park contains a few dozen routes just minutes from downtown. Lake Mineral Wells State Park. This park west of Fort Worth features face climbing on sandstone conglomerate bluffs in Penitentiary Hollow. Climbing is top-rope only, and the walls are typically 20 to 40 feet tall. Other: The Austin area offers rock climbing, mostly on pocketed limestone cliffs. Reimers Ranch, a Travis County park, has hundreds of routes along the Pedernales River. The Barton Creek Greenbelt offers in-town climbing along a creek.